"About the year 357, St Basil returned to Caesarea, where for a while he devoted himself to rhetoric. 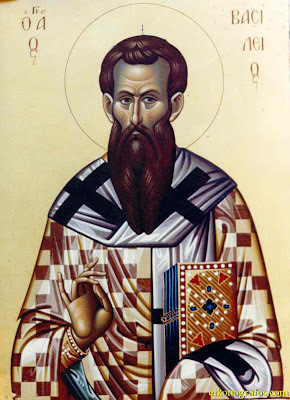 But soon, refusing offers from Caesarea's citizens who wanted to entrust him with the education of their offspring, St Basil entered upon the path of ascetic life. After the death of her husband, Basil's mother, her eldest daughter Macrina, and several female servants withdrew to the family estate at Iris and there began to lead an ascetic life. Basil was baptized by Dianios, the Bishop of Caesarea, and was tonsured a Reader (On the Holy Spirit, 29). He first read the Holy Scriptures to the people, then explained them. Later on, "wishing to acquire a guide to the knowledge of truth", the saint undertook a journey into Egypt, Syria and Palestine, to meet the great Christian ascetics dwelling there. On returning to Cappadocia, he decided to do as they did. He distributed his wealth to the needy, then settled on the opposite side of the river not far from his mother Emilia and sister Macrina, gathering around him monks living a cenobitic life. By his letters, Basil drew his good friend Gregory the Theologian to the monastery. Sts Basil and Gregory labored in strict abstinence in their dwelling place, which had no roof or fireplace, and the food was very humble. They themselves cleared away the stones, planted and watered the trees, and carried heavy loads. Their hands were constantly calloused from the hard work. For clothing Basil had only a tunic and monastic mantle. He wore a hairshirt, but only at night, so that it would not be obvious. In their solitude, Sts Basil and Gregory occupied themselves in an intense study of Holy Scripture. They were guided by the writings of the Fathers and commentators of the past, especially the good writings of Origen. From all these works they compiled an anthology called Philokalia. Also at this time, at the request of the monks, St Basil wrote down a collection of rules for virtuous life [and guidelines for monastics, his Asketikon]. 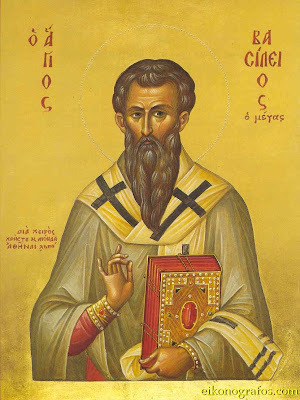 By his preaching and by his example St Basil assisted in the spiritual perfection of Christians in Cappadocia and Pontus; and many indeed turned to him. Monasteries were organized for men and for women, in which places Basil sought to combine the cenobitic (koine bios, or common) lifestyle with that of the solitary hermit." "Since we who, by God's grace, have set before ourselves one and the same goal of the life of piety, have gathered in one place in the name of our Lord Jesus Christ, and since you yourselves are clearly so keen to learn something of what leads to salvation, my duty is to declare the judgment of God, mindful as I am night and day of the Apostle's words: “For the space of three years I did not cease admonishing each of you night and day with tears” (Acts 20:31). The present time is indeed most suitable for us and the place provides tranquility and complete freedom from outside disturbances. So then. Let us pray for one another, that we, for our part, may give to your fellow servants their portion of food in due time and that you, for your part, may receive the word like the good earth and bring forth a mature and manifold fruit in righteousness, as it is written. I appeal you you therefore, by the love of our Lord Jesus Christ who gave himself for our sins, let us take thought for our souls! Let us lament the vanity of our former life! Let us, for the sake of the things to come, take up combat for the glory of God and his Christ and of the worshipful and Holy Spirit. Let us not remain stuck fast in this indifference and carelessness, ever losing the present opportunity through indifference and putting off a beginning of our labours till tomorrow or some other time. Otherwise we shall be overtaken without any supply of good works by him who requires our souls and be banished from the joy of the bridal chamber. Then shall we weep vain and profitless tears, deploring the time of our life that we spent so wastefully, when there shall be no more scope for repentance. Now is the acceptable time, says the Apostle, now is the day of salvation. This is the season for repentance, that for recompense, this for patient endurance, that for consolation. Now, God is the helper of those who turn from the evil way; then, he will be the dread and inexorable examiner of all human deeds, words, and motives. Now we enjoy his forbearance, then we shall know his justice, when we shall rise again, some to eternal punishment, others to eternal life and each shall receive according to his works. Until what occasion are we going to put off our obedience to Christ, who has called us to his heavenly Kingdom? Whenever are we going to become sober? Whenever are we going to recall ourselves from our habitual life to the strict way of the Gospel? Whenever are we going to set before our eyes that dread and manifest day of the Lord? On that day, those who by their good works draw near to the Lord's right hand shall be welcomed into the Kingdom of heaven, whereas those who for their barrenness of good works have been placed on his left hand shall be engulfed in the Gehenna of fire and everlasting darkness. In that place, he says, there shall be weeping and gnashing of teeth." Doxastikon of the Stichera in Tone 8. By Anatolios. You became a lover of wisdom, Venerable Father, and, preferring a life lived in companionship with God to all existing things, you abandoned concern for death, as befitted your life; for having destroyed for yourself the passions of the flesh by labours of self-mastery and by care for the Law of God, having kept dignity of your soul unenslaved by an abundance of virtue, you subdued all fleshly thought by the spirit; and so, having hated the flesh and the world and ruler of the world, as you stand before Christ, ask for our souls his great mercy. This is an amateur translation from a Greek text (http://www.agiooros.net/forum/viewtopic.php?f=18&t=2334&p=21551&hilit=%CE%B2%CE%B1%CF%83%CE%B9%CE%BB%CF%8C%CF%80%CE%B9%CF%84%CE%B1#p21551) of some compelling events from the life of St. Basil. Though the details vary considerably among different versions, there are multiple historical sources that attest to the basic story, including St. Amphilochius' life of St. Basil, and others from the 6th and 7th Centuries (http://www.jstor.org/pss/626537, http://www.ucc.ie/milmart/mercsrcs.html). What further complicates things is the resemblance to the story behind the Vasilopita (http://www.historyofgreekfood.org/?p=344). Most versions hold that St. Basil gathered the people's treasure to appease a merciless eparch. After St. Basil convinced him to change his mind, he had to return everyone's treasure. He asked some of his people to bake loaves of bread in which he hid their coins, jewelry, etc., and handed the bread out to his flock. Miraculously, each loaf contained precisely what each person had given. I have a hunch that this is referring to a distinct event from the life of St. Basil the Great, but regardless, may we emulate St. Basil's immense love and devotion to God and to his fellow men, and may he intercede for us all and help us! In the years when Julian the apostate wished to revive idolatry—as some try to do in our days (neo-idolatry)--and to build again the Temple of Solomon (in his attempt terrible flames poured forth from that place and he was unable to complete his task), he stopped near Caesarea on his way to Persia [for war]. St. Basil the Great knew Julian from Athens, when the two of them studied together, but each took a different road. The Metropolitan of the city [St. Basil.] therefore went out to meet the emperor and he sought three loaves of bread from those that the Saint ate. Of course the Saint ate barley bread and from those he offered to Julian. Julian accepted the gift and ordered St. Basil to be rewarded and for them to give the Saint grass from the field! And when he finished these terrible threats the emperor Julian, headed for Persia. The Saint returned to his see in Caesarea and called all of the people. When he told them the threats of the king to destroy the city and enslave them, he advised them to not hold back their money, but to care for their lives and to gather whatever they had in one place and when the king would return, they would throw their treasures in the streets, and being avaricious, he would be appeased and would not do any evil to them. The Christians went and gathered an uncountable treasure: gold, silver, and precious stones! The Saint placed them in the treasury, writing the name of each to keep them, until he learned of Julian's return. Therefore when he learned that he was returning, St. Basil gathered the Christians and told them all to fast for three days. Then they all ascended the mountain of Caesarea named Didymos, because it had two peaks. Then the Archbishop of Caesarea saw that the Martyr Mercurius came armed with his weapon, and having received the command from that woman who was the Most-Holy Theotokos, he disappeared immediately! 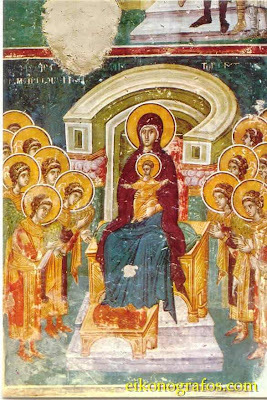 The Queen of the Angels, the Panagia, then called St. Basil and gave to him a book which contained all of the creation of Creation written, and then man fallen from God. In the beginning of the book was an epigraph which said, “He said”, while the end of the book which talked of the fall of man said “End” (this meant that because the Saint wrote a hermeneutical book on the Six Days of Creation of Moses [the Hexameron] and on the creation of the World in general, while the chapter on the creation of man by God he would not finish. It was completed however after his repose by his brother, St. Gregory of Nyssa). 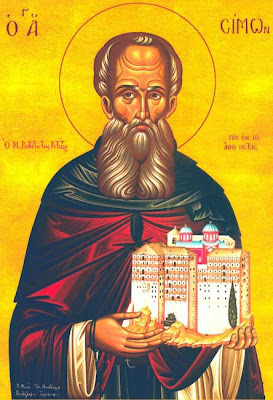 The Saint awoke from the vision right away and together with some Clerics he descended immediately to the city of Caesarea, where the Church of the Holy Great Martyr Mercurius was located, in which was found his relic and his weapons, as St. Mercurius was martyred there a hundred years before. Archbishop Basil entered this Church and not seeing the relic or the weapons, he asked the protector of the relics of the Church what occurred. He of course did not know anything. Then the Great Basil understood that it was a true vision and that the most impious Julian would be killed that night. The Saint therefore praised their willingness and ordered a third be given back to each from whom it was given, and the rest to be given to build homes for the poor, homes for strangers, hospitals, orphanages, etc. (all of these later comprised the wondrous Christian, philanthropic complex called Basiliad). 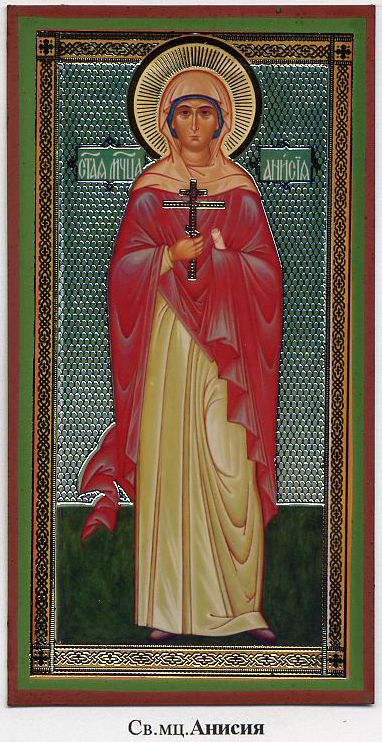 "The Holy Virgin Martyr Anysia lived in the city of Thessalonica during the reign of the emperor Maximian (284-305). 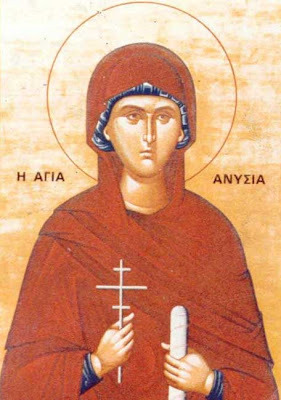 Upon the death of her parents, who had raised her in Christian piety, St Anysia sold everything she owned, distributing her riches to the poor, and she began to lead a strict life of fasting, vigil, and prayer. During his persecution against Christians, Maximian issued an edict stating that anyone had the right to kill Christians with no fear of punishment. Soon there were many bodies to be found in cities, towns, and by the roadside. Once, when St Anysia was on her way to church, a pagan soldier stopped her and demanded that she come along to the festival of the sun to offer sacrifice. St Anysia gently pulled herself away from him. When he soldier boldly grabbed her and attempted to tear the veil from her head, she shoved him, spit in his face and said, "My Lord Jesus Christ forbids you!" In anger, the soldier ran her through with his sword. Those gathering over her body wept and loudly complained against the cruel emperor for issuing an edict that resulted in the death of many innocent people. Christians buried the martyr near the city gates, and a chapel was built over her grave." And to become worthy of Thy Kingdom. To sacrifice myself for Thee. To be able to suffer for Him. Praying for us to the Immortal Christ. Your lamb Anysia calls out to You, O Jesus, in a loud voice: "I love You, my Bridegroom, and in seeking You I endure suffering. In baptism I was crucified so that I might reign in You, and I died so that I might live with You. Accept me as a pure sacrifice, for I have offered myself in love." Through her prayers save our souls, since You are merciful. 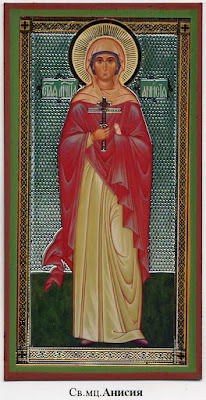 You righteously traveled the path of virtue, and were betrothed to the Word, O chaste Anysia, and you rejoiced in your struggle, as Melane shines with the radiance of dispassion, shining in the world with the rays of virtue; and now entreat ye Christ the Lord. As a two-fold lamp you illumine the Church of Christ with truly mystical radiance. You brought forth a hundred-fold fruit through your contest, O Anysia; and you shone forth in asceticism, O Melania. You were both found worthy of the incorruptible life of the righteous. The Saint was from the town of Kapourna near Makrynitsa of Peliou. He had pious parents, and he was the first of eight children in the family. His family name was Nicholas. His father, because of taxation, was forced to move the family to another town, where he could save the money as needed. The Saint was then twelve years old. His mother had a cousin who was a grocer in Velestino, who sought the small Nicholas to help in his store. In reality the child worked with great willingness. At one time a Turk named Ali, who frequented the grocery store, saw that the young Nicholas was bright, hard-working and obedient, and sought him from his uncle for one year to work in his harem, as he was still of a young age. The uncle refused, telling him to ask his mother for him. After one week the Turk returned angered, seized the small Nicholas by force and took him to his house to serve in his harem. After a year his father went and sought Nicholas from Ali. He responded, “I have a child in the war. As soon as my son returns, come and get your son.” In a few days the son of the Turk returned from the war, and seeing the child, he told his father: “Where did you find this Roman [Greek] child to work in your harem? It's incompatible to have a Roman work in a harem. I would want to have him circumcised, to become his sponsor and to have him work in the harem forever. And immediately this impious one began to tempt Nicholas. In the end, because of his arguments and the youth's young age, he convinced him to deny Christ and to convert to islam. After two months however, the child perceived his fall, and he repented and cried bitterly. There in Keramidi he for the Saint to be housed by a nun who they were related to, who gave him to some builders as a helper. After a few days the group of builders who were working left by boat for Crete and took him with them. The builders however unfortunately abused Nicholas and beat him inhumanely many time. Thus he left and strutted around a forrest. One day he found a small chapel, where the Divine Liturgy was happening. A priest saw this stranger in a poor condition, and asked him to recount his life to him. “Don't cry, my child” the priest told him. “I had an only son who died a few days previously. If you want, I can make you my son.” With great joy he accepted the priest's offer and Nicholas went with him to his home, where he and his presbytera took him in as their son. Thus he lived happily in the priest's house, learning the priest's trade of weaving. After three years unfortunately, the priest died, and his presbytera, because she couldn't support him along with their two daughters, gave Nicholas her blessing to leave to seek his fortune. He Saint cried in repentance to his spiritual mother and left. Wandering around Crete with one of his peers, they decided to go on a pilgrimage to Mount Athos. Once they reached Daphne by boat, they separated, and Nicholas began to visit the monasteries and sketes of the Holy Mountain. In the end he reached the Holy Monastery of Karakallou, where he confessed his fall and he re-entered the Church with the Holy Chrism and communed the Divine Mysteries. He remained in the Monastery, where he became a monk with the name Gideon. He lived with great obedience, humility, abstinence and countless ascetical struggles, which only God Who knows the heart knows, weeping continually for his fall. After 35 years of ascesis the desire for martyrdom was lit within his heart, and with the blessings of the fathers he left the Holy Mountain and traveled to Velestino, where he had originally converted and acted as a fool. On Holy Thursday he presented himself before Ali, who had him made a muslim, and confessed Christ. The Turk immediately sought to arrest him and lead him to the judge. On Holy Friday the Saint, wearing a crown of flowers and holding two red eggs, appeared before the judge saying: “Christ is risen.” There at the place of judgment, he did other strange actions which caused the judge to order him beat mercilessly and to throw him out as crazy. He sought that they deliberately put him to death, but it was not yet the will of God. He lived for some time appearing as a fool by day, but by night he withdrew to a cave, where he performed his ascetical feats. In the end, with his way of live and his words urging the Turks, Veli Pasha of Tyrnavo ordered his arrest. 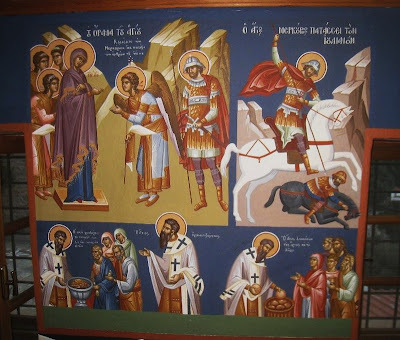 The Saint, who was prepared beforehand with the sacrament of Holy Unction and with Holy Communion, followed the soldiers of the Pasha to Tyrnavo. Before the Pasha, he confessed his denial, his repentance, his return to Christ, and his desire for confession and martyrdom there where he first denied. The Pasha locked him in prison. The next day, having called other high ranking Turks, he ordered them to bring the Saint before them. Again before them, the Saint confessed Christ with great boldness. They began to tempt him to return again to islam, but the Saint denied with contempt. They condemned him to death. They straightaway brought him before the Pasha who ordered them to cripple him, cutting off his hands and feet with an axe [as St. James the Persion, according to St. Nikolai's Prologue]. The Saint extended his limbs on his own without fear on the chopping block for them to be cut, without showing any sign of pain, without even showing any expression of one suffering, as if someone else were suffering. They left him bloody all day, and at night the Pasha ordered them to lift him up and throw him in a place where the waste ran from his house. He was still alive. In that filthy place the Saint gave up his spirit. 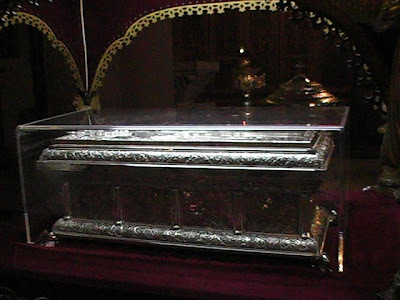 The Christians managed to take the holy relic and to bury it in the Church of the Holy Apostles. Immediately miracles began to occur, during the funeral and after his burial, to all those who venerated his tomb with reverence, and after the uncovering of his relics until today. Another account, along with those of many new martyrs of Orthodoxy, can be found in: Witnesses for Christ: Orthodox Christian Neomartyrs of the Ottoman Period, 1437-1860 by Nomikos Michael Vaporis. Crestwood, NY: St Vladimir's Seminary, 2000. For the Greek service texts of St. Gideon, see: Service (http://voutsinasilias.blogspot.com/2009/12/30.html), Akathist (http://voutsinasilias.blogspot.com/2009/12/30_29.html), Paraklesis (http://voutsinasilias.blogspot.com/2009/12/30_7238.html). "The Holy Monastery of Karakallou stands on a hillside between the Monasteries of the Megiste Lavra and Iveron. Of the traditions concerned with its foundation, the most likely is that which makes its founder a monk of the name of Karakalas of the early 11th century. The fact that the Monastery is mentioned in a deed of the Protos Nicephorus (1018) and omitted from the Second Typikon is some indication of its troubled history. In the 13th century, after raids of pirates and Latins, Karakallou was totally deserted. It was brought back to life by the action of the Palaeologue Emperors Andronicus II and John V and of the Patriarch of Constantinople Athanasius. The number of monks increased and the Monastery was restored. Nevertheless, it again became the victim of pirate raids. 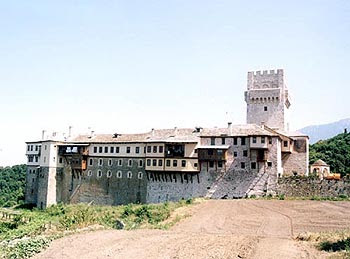 In the 16th century, with the assistance of the Prince of Wallachia John-Peter-who in the end became a monk of the Monastery-and the subsequent permission of Sultan Suleyman, the Monastery was rebuilt. In the 17th century the Monastery of St Nicholas in Ismailia was donated to Karakallou. During the second building phase at the Monastery, older constructions were restored and additions were made, but the reconstruction of a large part of the buildings became necessary after a major fire in 1875. Karakallou took an active part in the struggles to throw off the Turkish yoke. Of its buildings, a particularly noteworth piece of work is the tower of Peter, which was built in the 16th century and is the largest of the towers on the Holy Mountain. Karakallou occupies eleventh place among the monasteries of Athos, and has five chapels, two outlying chapels, and 18 kellia. Its katholikon is a building of the 16th century with additions in later centuries. It is dedicated to Sts Peter and Paul. The present refectory of the Monastery is a building of 1875, but its original form was much older. Included among the treasures of the Monastery are vestments and liturgical vessels, the skull of the Apostle Bartholomew and of St Christopher, and a fragment of the True Cross. The library contains 279 manuscripts and some 2,500 printed books. Today the Monastery has around 30 monks." May St. Gideon intercede for us all and help us! Όσιων ισότιμος, και Αθλητών κοινωνός, και θείον αγλάισμα, της Καρακάλλου Μονής, εδείχθης μακάριε συ γαρ στερρώς αθλήσας, τον εχθρόν ετροπώσω ένθεν Οσιομάρτυς, Γεδεών εδοξάσθης, πρεσβεύων υπέρ πάντων, ημών των ευφημούντων σε. Equal in honor to the Righteous, and a communicant with the Champions, and divine boast of Karakallou Monastery, you were shone O blessed one, you struggled strongly, and deposed the enemy therefore O Righteous Martyr, Gideon you were glorified, intercede for us all of us who praise you. December 28th 2009 completes with the grace of the All-good God 200 years from the righteous dormition of a worthy spiritual person of the Philokalian Regeneration movement, who shone forth as a new cenobiarch, becoming an example of austere ascesis and ceaseless prayer, meekness and discernment, philanthropy and humility. 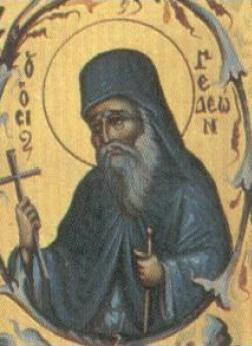 The word on the Righteous and God-bearer Nephon, who was given the title cenobiarch, who contributed to the growth of monasticism with the founding of hesychasteria and monasteries on the islands of the Aegean, struggling together with the other Kollyvades fathers for the preservation of the spirit of Orthodoxy, the spiritual regeneration of the people and the return to the ancient ecclesiastical tradition. He was born in 1736 in the town of Patrika of south Chios, and he lost his parents from the epidemic of the plague, at an age when Nicholas (his worldly name) was still an infant. He was taken-in by one of his aunts and when he reached adolescence, he left for Constantinople, where he apprenticed with a merchant. However the unexpected and dramatic murder of his friend by some Janissary, filled his soul with grief and despair. This terrible occurrence compelled him to leave Constantinople and head to Mount Athos. His first stop was the Monastery of Megisti Lavra, but after a short time he left for the Pantokratoros Skete, of today's Kapsala, where he was tonsured a monk with the name Nephon. Although he never studied at a school, he comprehended the Holy Scriptures and the writings of the Great Fathers of the Church with the grace of the Holy Spirit, and he nurtured special reverence for the Most-Holy Theotokos. 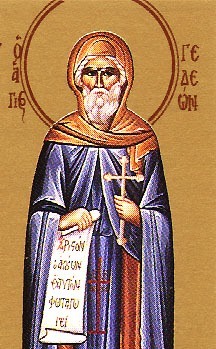 Together with the renowned author Alexandros Papadiamantis the Righteous Nephon struggled in asceticism together with other virtuous monks in the desert skete of St. Basil high on Athos. However because of the turbulent period of the spiritual movement of the Kollyvades the righteous Nephon, who had been ordained a priest, was shaken by the exacerbation of problems that arose and led to tragic events. The basic causes of conflict were the Kollyvades denying to perform memorial services on Sunday, which as is known is the day of our Lord's Resurrection. Of course in 1772 the Kollyvades prepared a petition to the Holy Synod of the Patriarchate of Constantinople, which together with the confession of faith they send to Constantinople with monk Nephon. The Patriarch of Theodosios II adopted a conciliar decision, with which he justified both conflicting sides. Then Nephon returned to Mount Athos without receiving the patriarchal decision. 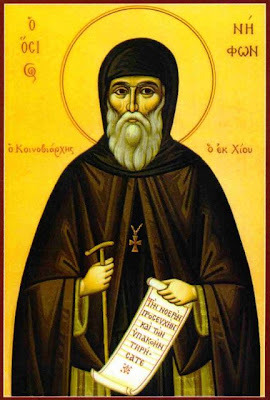 Seeing this grievous situation he planned to leave the Holy Mountain, for among others, St. Athanasios of Paros (1721-1813), who emerged as a brilliant representative of the so-called Kollyvades movement. Thus Nephon was forced to take refuge on various islands of the Aegean. His first stop was the fragrant and holy land of Chios, his beloved home, but after a short stay he traveled with his synodeia to Samos, where for a few months they inhabited the old monastery of St. Kyriaki, close to the town of Maratokampou. 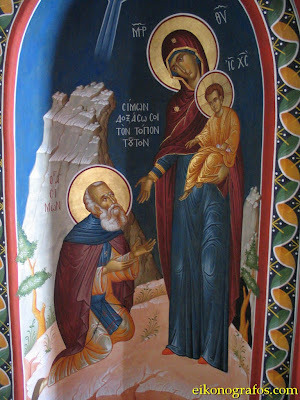 From Samos the Righteous Nephon along with the hieromonks Gregory of Nisyros, Athanasios from Armenia, and Arsenios Moraite reached Naxos, where along with tradition they remained at the historic monastery of Panagia Phaneromeni. In Naxos they met Nicholas Kalivourtzi, the subsequent eminent Philokalian father and bright teacher of Romiosynis, St. Nikodemos of the Holy Mountain (1749-1809), whom they convinced to follow the monastic life on the Holy Mountain. 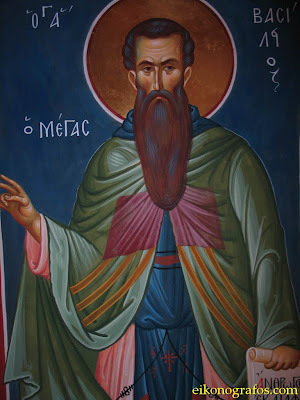 After Naxos they traveled to Patmos, where they met the honored and God-bearing hierarch of Corinth the Founder of Philokalism, St. Makarios Notaras (1731-1805). At this point the special spiritual relationship which developed between the Righteous Nephon and St. Makarios Notaras should be emphasized. Then the Righteous Nephon together with Gregory of Nysiros visited Leipsous, where in the deserted area of Romani they built the chapel—hesychasterion of the Evangelismos of the Theotokos from their great reverence towards the person of the Most-Holy Theotokos. In Leipsous the Righteous Nephon remained for a few months, after the pirate raids convinced him to abandon the island and to go to Phournous around 1775, where there also he founded a chapel-hesychasterion in honor of the Evangelismos of the Theotokos. The same year he began the founding of the holy monastery of Evangelismos of the Theotokos in Levkada a short distance from Agio Keryko, the capital city of Ikarias. Indeed on the lintel of the outer date of the Katholikon of the monastery bears witness to the year of its founding: “The following holy monastery was built by the most-righteous hieromonk Nephon, 1775”. 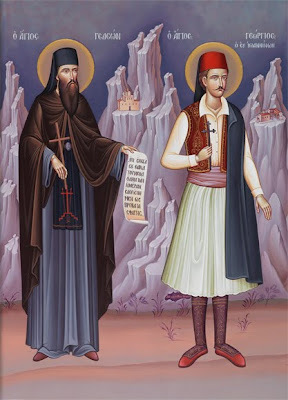 It is noteworthy that the influence of St. Makarios Notaras, who visited the monastery of Ikaria and remained with them for a sufficient period of time. Indisputable accounts of the gracious presence of St. Makarios in the monastery are the ruins of the cell, in which he stayed, along with the chapel built in the name of St. Makarios after his righteous dormition, on April 17th 1805. 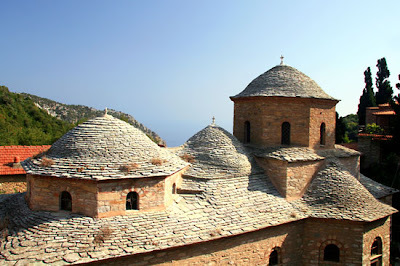 The historical monastery of the Evangelismos of the Theotokos on Ikaria was the blessed spiritual refuge of the God-bearing Kollyvades ascetics and remained an exemplary cenobium, where during the days of the Righteous Nephon the founder, the number of monks reached 25. It is also worth noting that the inhabitants of Ikaria especially loved the this Kollyvades monastery with the hospitality of Abraham, and it was known that the gates of the monastery were always open to all visitors, who found a rich meal and place to rest. 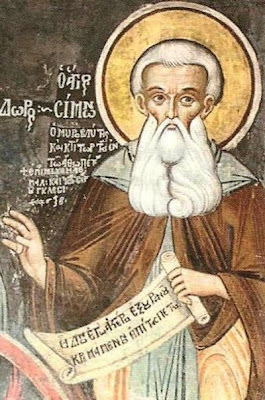 Moreover a multitude of people traveled to the monastery to be spiritually led by the meek, discerning and clairvoyant Elder Nephon, who was shone as a trainer of monks and guide of ascetics, making the monastery a center of intellectual and spiritual ascesis for the prospective clergy. 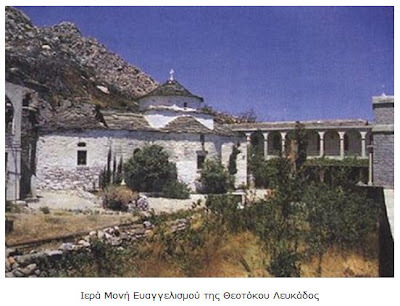 In 1778 the teacher of the Patmias school, Gregory Chazestamatis of Skiathos learned of the virtuous Elder Nephon and the well-known monastery of the Evangelismos of the Theotokos in Ikaria and decided to leave Patmos, where he was, to travel to the Kollyvades monastery. There he was tonsured a monk and proposed to Nephon to leave Ikaria and move to Skiathos, where his father Gregory had large plots of land. This in 1794 he reached Skiathos to found the holy monastery named Evangelismos of the Theotokos. The founding of the monastery began in 1794 and in September 1797 the monastery was proclaimed a patriarchal stavropegio. In 1798 papa-Gregory Chatzestamatis became the lawful inheritor of the family estate, which he gave to the monastery, which became known as the spiritual center and refuge for the inhabitants of Skiathos during the dark period of the Turkish occupation. Ineed in September 1807, 1,400 Greek freedom fighters persecuted by the Turks traveled to the monastery from all over Greece. In this great gathering of captains and fighters, Elder Nephon blessed the first Greek flag, which the National Assembly at Epidaurus in 1823 designated as the official flag design of our nation [Greece]. However the Righteous Nephon slowly began to seek greater hesychia and solitude and because of this he decided to return to his beloved Ikaria. However his desire never came about, because in December 1809 sensing his earthly end beforehand, he called his six novices and told them to go to Ikaria to renew the historical monastery, which he so greatly loved. Thus on December 28th 1809 the Godly-taught and landless Nephon the Righteous left his earthly life, receiving the crown of glory from the Freely-granting Lord. He was buried in the cemetary of the monastery of the Evangelismos on Skiathos, and all became witnesses to the first miracle: a monk, who was a paralytic for many years, was healed, when he embraced the precious body of the blessed Elder with reverence. In 1812 the uncovering of the holy relics of the Righteous one occurred, which emitted an indescribable fragrance, which was evidence and certification of his holiness and wonder-working. 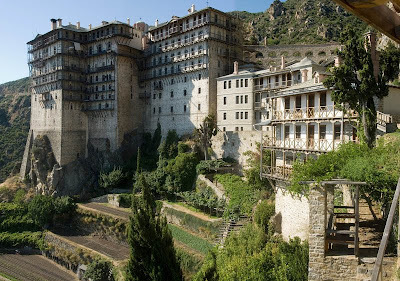 Indeed until 1876 Alexandros Moraitides confirmed that that the precious skull of the Righteous Nephon was preserved in the monastery. 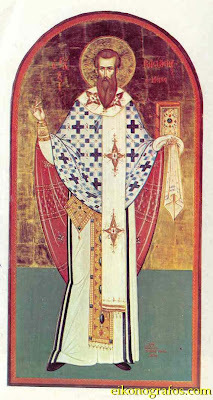 May the Godly-inspired and virtuous Righteous Nephon, the pious offspring of the holy land of Chios and the fragrant boast of the islands of the Aegean, teach us and instill in us spiritual things with the divine zeal and depth of faith, with his meekness and patience, with his indigence his humility and with the true Orthodox ecclesiastical spirit, as he bequeathed to us the blessed choir of Kollyvades fathers with the momentous apostolate to the Greek Orthodox of our People. 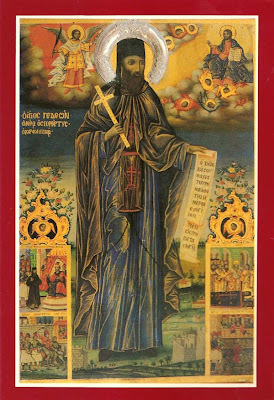 On the timeless worth of this spiritual movement, Monk Moses of the Holy Mountain notes: “The Kollyvades movement is very topical, when again many wish to offer in the Church comfort without ascesis, joy without struggle, happiness without joy-making sorrow, innovations without knowledge of the austere precision of the evangelical Tradition of holy fathers. For more information on the Kollyvades movement, see: http://full-of-grace-and-truth.blogspot.com/2009/04/synaxis-of-holy-kollyvades-fathers.html, http://full-of-grace-and-truth.blogspot.com/2009/07/st-nikodemos-of-holy-mountain.html. Κολλυβάδων ἐνθέων, καὶ τοῦ Ἄθω ὡράϊσμα, ὤφθης ὑποδούλῳ σου Γένει, Ἀναστάσεως αὐγασμα. Ὡς μύστης γὰρ Θεόπαιδος σεπτός, προδρόμους καταυγάζεις νηπτικῶς, ἀλειπτῶν Νεομαρτύρων, Κοινοβιάρχα Νήφων ἱερώτατε. Δόξα τῷ δεδωκότι σοὶ ἰσχύν, δόξα τῷ σὲ θαυμαστώσαντι, δόξα τῷ ἐνεργοῦντι διὰ σοῦ, πᾶσιν ἰάματα. Divine one of the Kollyvades, and the beauty of Athos, you were shown as a servant of your People, with the splendor of the Resurrection. As a mystic and sacred child of God, and forerunner shining forth nepsis, trainer of Neomartyrs, O Cenobiarch Nephon the most-holy one. Glory to Him Who gave you strength, glory to Him who made you wondrous, glory to Him Who grants to us through you, healing for all. 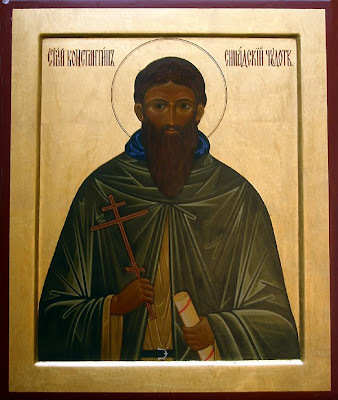 St. Constantine the Righteous of Synnada, "of Jewish descent"
O θείος ανθεί και θανών Kωνσταντίνος. The divine Constantine blooms and dies. This Saint was of Jewish descent from the city of Synnada. Once when he was very young, he was following his mother. And seeing a Christian who, having yawned, signed his mouth with the sign of the Precious Cross, from then he did the same, imitating the Christian. Not only this, but the other works of the Christians instilled in him fervent faith. Because of this his face has illumined with divine illumination. And he was taught by God the Christian dogma. And he didn't eat for a period of a few days. To this Saint once a Jewish woman appeared in a lustful manner. The Saint made the sign of the Precious Cross, and the woman fell dead, and again he resurrected her. He was led by a divine cloud to a Monastery, called Fouvoution. There were found magnificent men who embraced the ascetical life, and in whom virtue shined. He was led to the Abbot of the Monastery, and he told him to bring him the Cross and to venerate it and embrace it. When this blessed one embraced the lower part of the Cross with fear and piety, then, O the wonder! the whole Cross was imprinted on his righteous head. This remained on his head until his death. When he received Holy Baptism, he was named Constantine. What followed was wondrous. In that place, there was a rock which he stepped on as he exited the baptismal fount, and paradoxically his foot was imprinted there. After this he took on so many spiritual struggles, that he surpassed all the Monks of the Monastery in his strictness and asceticism. He worked with the trade of the Apostle Paul, stretching skins and making tents. When he prayed, the place in which he was would fill with fragrance. When he went to Church, the gates of the Church opened to him at his word. From the great purity which he had, he saw noetically the thoughts of the brothers. Later he left and went to Mount Olympus. From there he went to Myra of Lycia. Then he went to Cyprus and then to Attaleia, where he crossed a river by foot that was so deep and large that one would need a boat to cross it. From there he walked to many other places, and again returned to Olympus. There he spent forty days not only fasting, but also buried to his waist in a pit. After this, without his desire, he accepted ordination to the Priesthood. Then he went to Atroas, always keeping the same spiritual struggles. He foresaw his dormition eight years before hand. And this he departed for the Lord, having clearly seen before hand all these things. "On December 28, shortly after the Feast of the Nativity, the Church celebrates the memory of St. Simon the Myrrh-gusher through whom the Lord wrought great wonders. A star, like that which led the Magi to Bethlehem, miraculously revealed to the saint the site upon which, by divine command, he was to found a monastery. The monastery was appropriately dedicated to the Feast of the Nativity and was named New Bethlehem. Today, seven centuries later, it is still one of the flourishing monasteries on Mt. Athos. 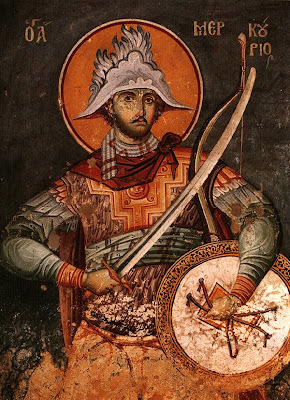 The life of the venerable Simon was arrayed with mighty ascetic feats and miracles not only during his lifetime, but even after his repose when there gushed forth from his relics are abundant fount of myrrh in a manner similar to that of the Great Martyr Demetrius of Thessalonica. Where he came from, who his parents were, and where he began his monastic labors, no one knows. 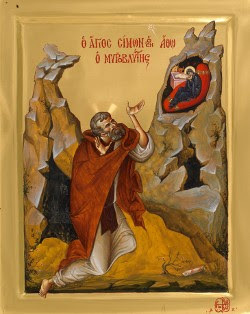 Some time in the 13th century, he arrived on the Holy Mountaim Recalling the saying of the Fathers that without obedience one cannot be saved, the venerable Simon sought before all else to find a spiritual elder, one to whom he could entrust his soul without reserve, an elder who would be not only a faithful guide unto salvation and a radiant model of ascetic perfection, but also strict in bodily discipline. After looking all over the Holy Mountain, he finally chose out of the multitude of monks leading virtuous lives, an unknown elder, perfect in all respects in the ascetic life. He labored in complete submission to his elder, fulfilling all his obediences with love and zeal and soon attained to such great spiritual heights that he became known all over the Holy Mountain for his irreproachable life. Finally. the time came when the elder was convinced that his period of trial was over. Casting aside his paternal kindness towards the venerable Simon, he decided to dwell with him. as with a brother and on several occasions he even asked for his advice and counsel. But instead of rejoicing over the benevolence and honor bestowed upon him by his elder, Simon was utterly grieved. He decided to leave, seeking for himself total reclusion. Expressing his intention to his elder, he asked his blessing amidst a shower of tears, desiring with heartfelt sorrow that the elder would grant his consent. In this way, he took leave of his dear elder for whom he had already become not so much a disciple as another mighty co-struggler in the angelic life. For a long time St. Simon searched all over the Holy Mountain for a secluded hermitage where no one would know of his existence and no one would find him. Finally, with God's help, he found a deserted mountainside with caves on the southern part of the Holy Mountain. Knowing that before him lay the relentless struggle of unseen warfare, the saint clothed himself with spiritual armor with the help of the Holy Spirit, taking the cross, prayer, faith, patience, fasting, and everything that could crush the wily schemes of the demons and raise a man to angelic purity and childlike simplicity. It is difficult to recount the fierce s c h e m e s and hidden traps with which satan tormented and tried to catch unawares Saint Simon. The holy ascetic, however, boldly trampled upon the brazen arrogance of his adversary and crushed all his plans. For many years St. Simon remained secluded within his cave where he manfully endured the constant battle with the unseen enemies of his soul. He lived in sorrows and utter deprivation, lacking even the assurance of his own salvation. 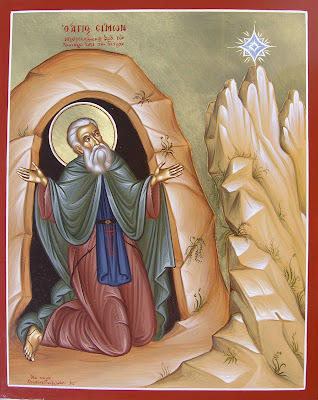 One night, while persevering in prayer, the righteous one saw outside his cave, as if before his very eyes, the effulgence of a divine light; an ineffable fragrance spread all around him and he heard a loud voice: "Simon, Simon, thou faithful friend and servant of my Son! Do not go away from here. I shall glorify this place; you shall be its guiding light, and your name shall be glorified.'' Out of caution, Simon chose at first not to believe this vision, not desiring to fall into the nets of the evil one; for he knew, according to the word of the Apostle, that satan could transform himself into an angel of light. Neyertheless, he continued to ponder upon the actual source of the voice. This took place shortly before the Feast of the Nativity of Christ. Then, one night, walking outside his cave, he saw a strange apparition: a star descended from the heavens and came to rest just above the rocky cliffs where later the holy monastery was to be situated. This same vision repeated itself on the following evenings; but the venerable Simon was still fearful. Wasit possible that this was solely one of the consequences of his intense spiritual warfare? And he continued to distrust the vision. When the Eve of the Nativity of Christ arrived, he saw in a dream a brilliant star and heard a divine voice: "Simon! you must build a monastic dwelling here. I myself shall help you. Cast aside your doubts, or you shall be punished for your unbelief." The same voice spoke to him three times. At that time (as he later related to his disciples) it seemed to him that he was in Bethlehem of Judea, in the very place where the shepherds were tending their flocks, and he heard the sweet sound of angelic singing: "Glory to God in the highest, and on earth peace, good will toward men: fear not, for, behold, I bring you tidings of great joy, which shall be to all people" (Luke2:l4, 10). After this, said the saint, all fear and uneasiness were dispelled from my soul and I rejoiced in spirit, and secretly beheld the scene in Bethlehem; there, before the manger, the Sovereign Lady stood before the Divine Child, lying in swaddling clothes. Several days after the Feast of the Nativity, three rich men, brothers after the flesh, came to the venerable one. They confessed all their sins and began persuasively to entreat him to permit them to live in obedience under his direction. After a brief period of trial and testing, St. Simon revealed unto them, as to his own sons according to the spirit, the divine vision. More than once he related to them the v i s i o n concerning the building of a monastery on the neighboring cliffs, asking them not to speak of this to any, one while he was still alive until the proper time. Hearing all this, the brothers with love offered to the saintly elder all of their earthly wealth for the construction of the monastery, and in accordance with the saint's wish and blessing, they offered immediately to prepare everything necessary for such an important and God-pleasing labor. All necessary preparations were made. They had yet to learn, however, of the exact site for the foundation upon which the monastery was to be built. When St. Simon directed the brothers to the location where the church and other buildings were to be constructed they w e r e horrified, seeing t h e sheer cliffs which, according to his orders, were to serve as the monastery's foundation. "Are you trying to fool us, Abba?" they asked the saint, 'or are you speaking the truth? How can this be the site, when that cliff might be quite dangerous for the workers and even more so for those that will dwell here. If this is your desire, we shall surely oppose you !" The matter was left undecided. In the meantime, seeing that he could not convince them to proceed with the work, St. Simon ordered the trapeza meal to be served. While they were eating, one of the saint's disciples who was bringing wine to the table, lost his , balance ,through the prompting of a demon, and fell off the cliff into a great abyss; still holding in one hand a pitcher and in the other several glasses of wine. Stricken with horror at this sudden tragedy, the spokesman of the brothers strongly rebuked the venerable one: "Behold, Abba, what has already been wrought by these deadly crags before you have even begun your undertaking. How many similar incidents of such a frightful death will occur if we should agree to build the monastery here." The saint did not answer but secretly prayed to the Sovereign Lady Theotokos that he would not be put to shame in placing his trust in her intercession. "Who can tell of all thy miracles, O Sovereign Lady, and who can praise thy majesty?' What happened next was entirely unexpected: the brother who had fallen over the precipice suddenly appeared before them. Through the intercession of the Most Holy Theotokos he was not only perfectly whole and unscathed, but he even held the glasses and pitcher from which not a drop of wine had spilled! Such a miracle brought fear and trembling upon the laborers. They fell to their knees before the saint and beseeching forgiveness said: "Now we know, O father, that you are truly a man of God." With heartfelt sincerity they were all grateful to be numbered among the saint's disciples and were soon accounted worthy of the angelic habit. 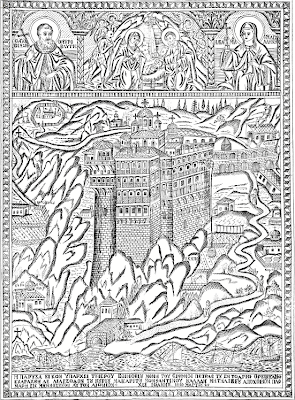 Then, under the immediate supervision of the venerable Simon himself, his disciples, formerly simple laborers, proceeded with the construction of the Monastery. The situation, however, was such that before anything else it was necessary to lay the foundation. According to the instruction of the saint, they were to use a nearby stone of enormous size. The elder ordered them to move it, but they, forgetting about the miracle of the unspilled wine, were of the firm opinion that not only was it impossible for them with their combined efforts to move that massive weight, but that it could not even be budged. They stood there bewildered, not having the slightest idea what to do. Seeing this, the saint approached them and, making the sign of the life-giving Cross on the stone, he single-handedly lifted it upon his shoulder and carried it to the designated site. In this way he demonstrated in actual fact the truth of the word which the Lord spoke unto the Apostles: "Verily I say unto you, if ye have faith as a grain of mustard seed, ye shall say unto this mountain, Remove hence to yonder place; and it shall remove" (Matt. 17120). That such a man, whose body was weakened by fasting and ascetic labor, should lift such a weight far exceeding human strength, can only serve as a testimony of God's almighty power and His readiness to help those who turn to Him with faith. Having established the monastery which he named New Bethlehem, and having spent his life in God-pleasing labors, St. Simon reposed on the 28th of December, 1287. On the morning of the next day, in the presence of the entire brotherhood, the face of the righteous one shone with a wondrous light. After his soul had ascended unto the choirs of the righteous, a fragrant myrrh issued forth from his holy relics through which St. Simon worked many miracles to the glory of God, for kings, monks, and laymen. Many years after the saint's earthly departure, a pious Serbian king helped to greatly enlarge and rebuild the monastery in honor of its founder. Since that time it has been known as Simonopetra, or the "Rock of Simon". Today it is perhaps one of the most awe-inspiring architectural monuments in the world, a standing testimony to the power of faith and God's good will toward men." "The Holy Monastery of Simonos Petra, or more simply Simonopetra, is without doubt the most daring construction on the Holy Mountain. It stands proudly at a height of 330 metres on the end of a rocky mountain range. The Monastery was founded by the Blessed Simon the Myrrhobletes around 1257, as a result of a vision. The whole of the building work, the Life of the Saint assures us, was accomplished as the result of divine intervention. In 1363 the Monastery was renovated with generous donations from a Serb despot, John Uglesha, who is regarded as the Monastery's second founder. 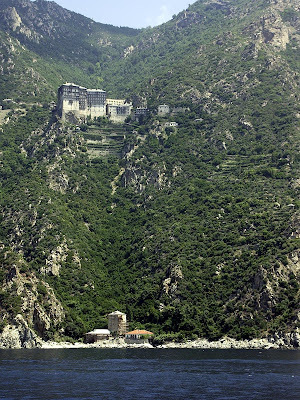 In the Third Typikon, Simonopetra occupies 23rd place among the then monasteries of Athos; today it holds thirteenth place in the hierarchy. Unfortunately, among the dates which are milestones in the history of the Monastery are those inauspicious days when it was afflicted with the scourge of fire. In 1570 the Monastery, together with its valuable archive, was destroyed by a great conflagration. This resulted in the loss of documents of inestimable historical value. It also explains why we know so little about the Monastery in the Byzantine period. The good relations which developed between Simonopetra and the Princes of Wallachia in the period of Turkish rule made possible its recovery. However, there was another fire in 1622, causing further damage. Simonopetra, which had been a coenobium, became idiorrythmic in the 17th century. Although never looted by pirates, the intolerable taxes of the Turks drove the Monastery to decline and abandonment. By the heroic efforts of the priest-monk Ioasaph of Mytilene, Asimopetra (as Simonopetra was called in the period of Turkish occupation) began to function again in the late 18th century. The 19th century saw the building of the multi-storeyed building on the south side. At the end of the same century, in 1891, yet another disastrous fire swept away, yet again, the older buildings and the Monastery's treasures. 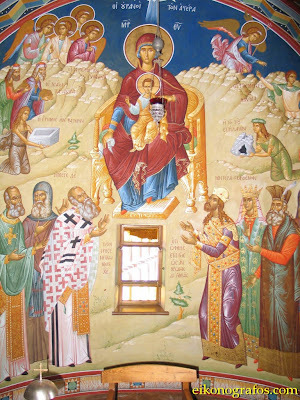 In the present century, Simonopetra has experienced a period of recovery and of increasing prestige in the Orthodox world - particularly after the liberation of the Holy Mountain from the Turks and under the enlightened ladership of the Abbots Neophytos, Ioannikios, and Ieronymos. In the 1950s, however, a period of decline set in and in 1963, when Athos celebrated a millennium of life, the prospects for the future were gloomy. But the 1970s were a time when there was a gradual revival of Athonite monasticism. In 1973 a new 20-member brotherhood from the Meteora established itself at the Monastery. The Monastery of Simonos Petra once had a large number of metochia with fertile farm land. The oldest of these would appear to be Petriotiko in Sithonia. Today, best known are St Charalampus in Thessaloniki, the Ascension in Athens, the [Convent] of the Annunciation at Ormylia in Chalcidice, and three others in France. It is also worth mentioning the metochi of Michael Voda in Bucharest, dedicated to the Monastery in 1566 and confiscated by the Romanian Government in 1863. Simonopetra, because of the restricted space of its site, is not one of those monasteries where we can see autonomous, clearly distinguished buildings. The katholikon is dedicated to the Nativity of Christ and in its original form was built around 1600, while the form it takes today took shape after the fire of 1891. The Monastery has four chapels within its precinct and eight outside. The Monastery's archive contains a host of documents in Greek, Turkish, and Romanian, together with inscriptions, and musical and other manuscripts, to which must be added its printed books. However, it must be pointed out that almost the whole of the archival material is post-Byzantine. The sacristy contains a treasury of works of art, consisting of icons, vestments, silverware, antimensia, seals, and engravings. However, the most important treasure of Simonopetra is the left hand of St Mary Magdalene - she is regarded as 'co-founder' of the Monastery - which has remained whole for two thousand years. The Monastery today has a community of 50 well-educated and active monks." Τη ασκήσει εκλάμψας εν Άθω Όσιε, ως καθαρθείς την καρδίαν των αρετών τω φωτί, εδοξάσθης θαυμαστώς Σίμων μακάριε, διό και βλύζειν κρουνηδόν, μύρα εύοσμα ημίν, ηξίωσαι μετά τέλος. Αλλά μη παύση πρεσβεύων, ελεηθήναι τας ψυχάς ημών. 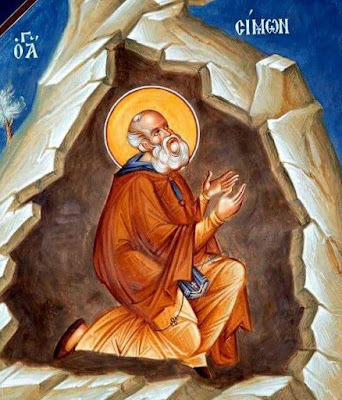 You shone forth on Athos in asceticism O Righteous one, as purified in heart with the light of virtues, you were wondrously glorified O blessed Simon, and therefore pouring forth rivers of fragrant myrrh to us, make us worthy after the end. But cease not to intercede, for mercy on our souls.